The Kayan, Sihan, and Lahanan are three of the numerous ethnic groups of central Sarawak (Malaysian Borneo) living on or near the Rejang River. Together all of these tribes are called Orang Ulu or "upriver people," and most of them tattooed. Unlike the neighboring Iban, all Orang Ulu tattoo artists were women. Orang Ulu tattoo hasn't been practiced for many years, but the designs worn on living flesh continue to be stunning in their simplicity yet powerful in their abstraction. Until recently, tattooing here remained relatively unrecognized from an artistic standpoint. But for this small group of talented women, handtapping was the purest form of tattooing. Their kit consisted of natural objects - wood, thorns, grass fibers and pigments - that came from the jungle, a place where all things, animate and inanimate, have a life and spiritual energy of their own. Around 1900, the tattooing of a Kayan girl was a serious operation, not only because of the considerable amount of pain it caused, but also on account of the elaborate ceremonial attached to this form of body ornamentation. The process was a long one, lasting sometimes as much as four years, since only a small piece could be tattooed at a sitting and several lengthy intervals elapsed between the various stages of work. A girl, when about ten years old, would have had her fingers and the upper part of her feet tattooed and, about a year later, her forearms should have been completed. The thighs were partially tattooed during the next year, if she could afford it, and in the third or fourth year the remainder of the marks were laid on the skin. Girls could not be tattooed during menstruation, because it was believed that the flowing blood attracted evil spirits. Tattoo (tedek - tuh'duck) amongst Kayan women was universal. They believed that the designs acted as torches after death, leading them through the darkness of the afterlife to the longhouse of their dead ancestors. Women, never men, performed the tattooing, and it was always the women who were the experts on the significance and quality of the tattoo designs, though the men actually carved the stencils on wooden blocks. The office of tattooist was a hereditary position and the artist, like blacksmiths and carvers, worked under the protection of a tutelary spirit who was propitiated with sacrifices before each tattoo session. Most Kayan tattooists were restricted by social taboos. For example, if the children of the artist were of young age, she was prohibited from tattooing since the release of blood attracted evil spirits - spirits that could easily possess her offspring and cause sickness or death. Tattooists couldn't tattoo during rice- seeding time nor if a dead person was lying unburied in the longhouse, since it was taboo to let blood during these occasions for fear of disturbing the ritual harmony of the household. Bad dreams, such as those of floods that foretold of much bloodletting, would also interrupt the work. Tattooists were also forbidden from eating certain foods like raw and bloody meat or fish, because evil spirits might enter the food and possess the artist. It was believed that if an artist disregarded any of these prohibitions, the designs that she tattooed would not appear clearly in the afterlife, and she herself would sicken and die. Sometimes women became tattoo artists in order to become cured of particular illnesses, since Bua Kalung, the tutelary spirit of tattoo artists, protected them from disease-bearing spirits. 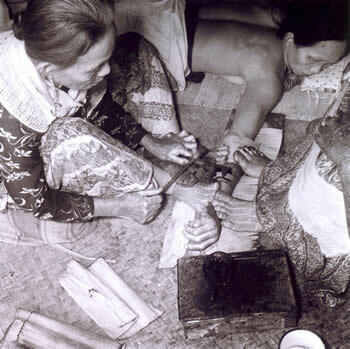 The tools used by the tattooist were simple, consisting of two or three thorn prickers (ulang or ulang brang) and an iron striker, tukun or pepak, kept in a wooden case, bungan. The prickers were wooden rods with a short pointed head projecting at right angles at one end. To the point of the head was attached a lump of resin that was embedded with three or four short needles, their points alone projecting from the resinous mass. The striker was merely a short ironwood rod, half of which was covered with a string lashing. The pigment was a mixture of soot, water, and sugar-cane juice, and was kept in a double-shallow cup of wood, uit ulang. It was believed that the best soot was obtained from the bottom of a metal cooking pot, but that derived from burning resin or dammar was also used. 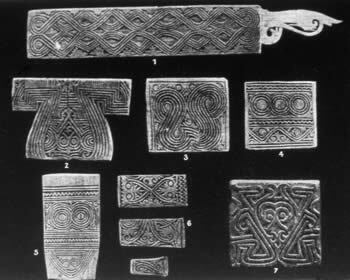 The tattoo designs were carved in relief on blocks of wood (kelinge) that are smeared with the ink and then pressed on the part to be tattooed, leaving an impression of the designs. The client who was to be tattooed lay on the floor, the artist and an assistant squatting on either side of her. The tattooist first dipped a piece of fiber from the sugar palm into the pigment and, pressing this onto the limb to be tattooed, plotted out the arrangement of the rows or bands of the design. Along these straight lines the artist tattooed the rows of lines (ikor) then, taking the tattoo block carved with the required design, smeared it with pigment and pressed it on to the limb between two rows of ikor. The tattooer or her assistant stretched with her feet the skin of the part to be tattooed (this sped up the process) and then, dipped a pricker into the pigment, tapped its handle with the striker as she worked along a line, driving the needle points into the skin. The operation was painful, but the tattoo artist was never moved and proceeded methodically with her task. According to one account of 1900, the fees paid to the artist were more or less fixed. For the forearms, a small gong, tawak, $8 to $20 dollars was paid according to the workmanship required. For the thighs, a large tawak was paid, as much as $60, if the very best workmanship was demanded. If only inferior workmanship was required, a gong of $6 to $20. For tattooing the fingers, the operator received a parang, or short sword. 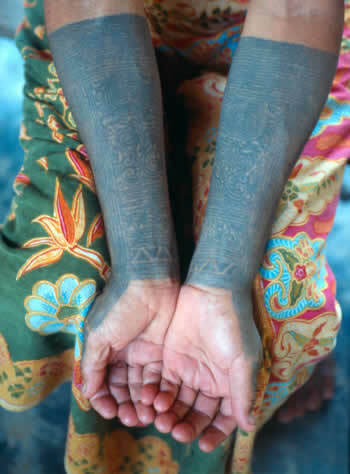 According to one Kayan woman I interviewed on the Rejang River in 2002, her thigh tattoo (kulan higo) cost one gong, several strands of old trading beads, two pigs and one parang. In the 19th century, it was said that the tattooist would die within a year if her charges were excessive. Most Kayan tattooing ceased over 40 years ago, and I could find no living traditional artists on the Rejang River in 2002. This photo shows one of the last Kayan tattooists working in 1951. Photograph courtesy of the Sarawak Museum. 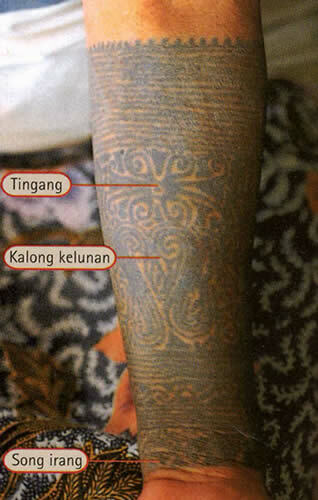 For larger tattooing patterns, Kayan tattooists used wooden stencils called kelinge. These intricately carved blocks were made by the male craftsmen of the tribe. 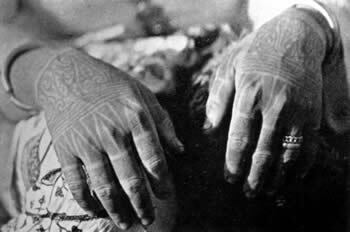 Tattoos were handtapped onto the fingers of Kayan women in various patterns. Black spikes running from the knuckles to mid-digits were a fairly common design. This motif, called song irang ("shoots of bamboo"), expresses a connection between plant life and fertility while the anthropomorphic (kalong kelunan) and animal designs (tingan, aso') on the wrist and back of the hand represent protective spirits. carved graves of aristocratic Kayan women. Sihan woman with arm tattoos. Her forearms are tattooed with hornbill (tingang) and kalong kelunan motifs, while the wrists are marked with "shoots of bamboo" (fertility symbols). Kalong kelunan, a stylized human figure in a squatting position seen between the S-fret designs, has various forms and usually is reinforced by a stylized hornbill motif (at top): at other times it is anchored by aso' or the dragon-dog design. Aristocratic women wore the kalong, because it was believed that they were closer to the spirit world than laypersons and only they could resist any negative magic associated with the design. 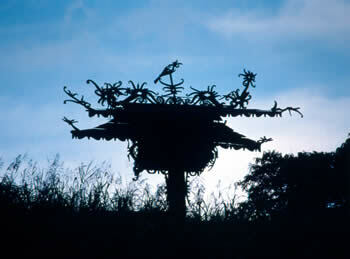 In the distant past, the motif may have represented a ritual offering, depicting a slave sacrifice, or a guardian spirit. 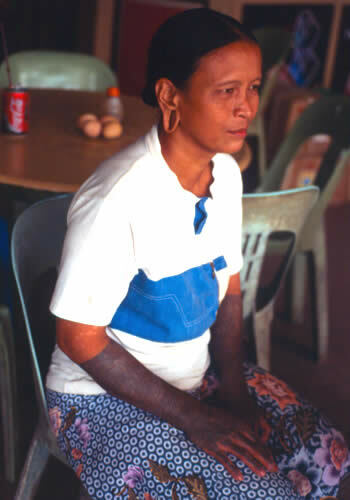 Lahanan woman with full compliment of protective, traditional arm tattoos. Many motifs, reminiscent of tendrils and hooks, symbolize floral imagery and fertility. To the Orang Ulu, plants are regarded as major living things, sharing the same fundamental properties of life and death as humans. The hornbill (tingang) and kalong kelunan tattoos appear on her forearm. Both designs are protective in nature repelling evil spirits. Double moon motifs also comprise this intricate tattoo. Kayan foot tattoos (panyat). Panyat means "to stretch." 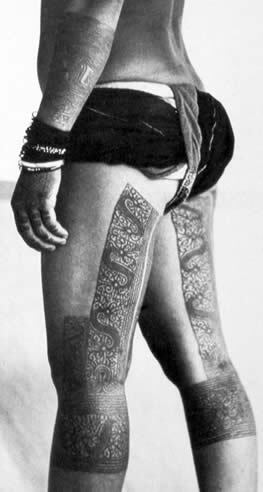 Thigh tattoos of an elderly Kayan woman (80+ years) of the Upper Rejang River. The anthropomorphic faces worn upon her skin are protective ancestral spirits. Thigh tattoos were expensive and generally restricted to aristocratic women who could afford them. Today thigh tattoos (kulan higo) are rarely seen on women under 70 years of age. 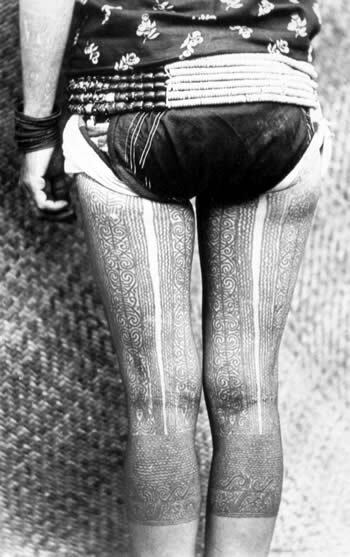 Snake-like aso' (dragon-dog) tattoos slither down this Kayan woman's legs, ca. 1925. They combined with other tattoo forms to repel evil and to induce fertility. by the number of rings around her calves. The motif running up the thighs is called silong lejau (tiger's faces). At the terminus of these bands you can barely make out a different pattern just above the horizontal lines of the calf. This is called nang klimge ("important design") and is a degraded anthropomorph. The curclicues below the horizontal lines around the calves are called tushun tuva "the tuba root motif"). Each one of these designs was believed to repel evil forces in the jungle. The unmarked portions of her thigh are also visible. The Sihan are a very small indigenous group of approximately 150 persons who live in one longhouse two hours inland from the Rejang River. They speak a dialect of Kayan and their tattooing traditions are very similar. The Sihan, however, carried their indelible arts further into the present than the Kayan, abandoning them only 30 years ago. The Kayan stopped tattooing 50 years ago. Konok, a 50-year-old Sihan woman, told me she received her first tattoo (arm) at 18 years of age, just before marriage. Tattoos were pricked in with thorns and were requisites for marriage. Men would not marry a Sihan woman without them. Sihan women were the tattoo artists and employed the same methods and motifs as the Kayan. The position of tattooist was hereditary, usually passed from mother to daughter. At death, the tattoo artist was buried with her equipment. The Lahanan, a larger neighboring group, also excelled in tattooing. Tattooists were women and the profession was hereditary in the female line. One 60-year-old woman, Bangu, gave me a vivid account of her circa 1950 tattoo experience and the price list for each tattoo in Malaysian Ringgits (RM). "Several women held me down, each took a limb, and another woman stretched the skin for the tattooist who began working once I was calm. I wanted to get through it because I wouldn't get a husband if I didn't. It took four days to tattoo one arm (60 RM) and four for the other (60 RM); four days for one foot (3 RM) and four more for the other (3 RM). I was 15 years old at the time and we did all the tattoos in those 16 days! It usually took much longer, but I wanted to get it over and get married." Two Lahanan men, who were tattooed by women, mentioned that if you had no money you paid for your tattoos with a gong or a parang (short sword). One of these men, 85+-year-old Pugwun Bapai, told me he was tattooed for a 25 RM fee at the age of 15. A special party was held in his honor after the ritual, because he was "no longer a boy but a man." 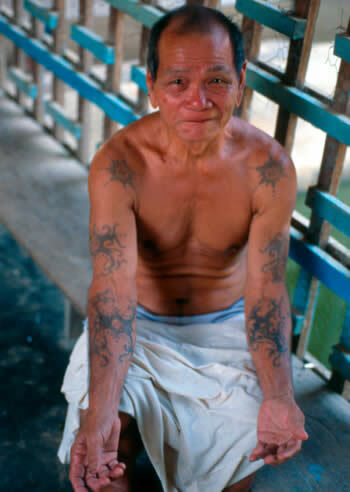 Lahanan men who were not tattooed were shamed by their peers, because only true "warriors" were tattooed, men who had partaken in perilous journeys or headhunting raids away from the security of the longhouse. Today, Orang Ulu tattoo is a dying, if not already dead, traditional practice. Disruptions to indigenous culture as a result of missionization and modernity continue to pave the way for a relinquishing of ancient customs. One Lahanan man said, "This generation of Orang Ulu are not interested in old ways. They have no desire to get the older traditional tattoos" and are drawn to urban centers, logging camps, or frontier towns where they can find work and become more open to other cultural influences, including fast, accessible and less painful Western tattoos like eagles, dragons and hula girls. Missionaries continue to convert and compel people to discard their traditional customs, and the Malaysian government is in the process of building the largest hydroelectric damn in all of Southeast Asia on the Upper Rejang River. The Bakun Dam project has already has displaced 10,000 Kayan and other Orang Ulu living in a dozen or more longhouses; longhouses that have stood on ancestral lands for centuries, if not millennia. Eventually the Bakun Dam will flood a tract of virgin rainforest that supports over 40 species of endangered mammals and birds. Understandably, and poised on a fragile prelude of change, the Orang Ulu have not yet folded to modernity, but as the jungle slowly disappears underneath the ensuing canopy of water, so too will that which gave life - and tattoos - to all of its peoples.